Last weekend, I had the privelage of flying from my home in Los Angeles to Atlanta to work with 10 knuckleballers. They flew in from as far away as New York, North Carolina, Alabama and Texas. 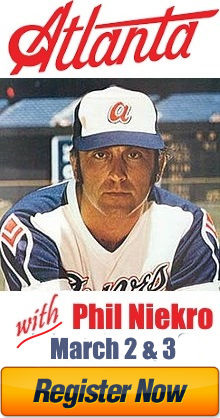 And they were all converging for a very special reason — Phil Niekro. The 77-year-old Hall of Fame knuckleball pitcher tossed the butterfly for 24 years in the Major Leagues for the Atlanta Braves, Toronto Blue Jays, Cleveland Indians, and New York Yankees. I am proud to count the 300 game winner as a mentor and friend. So, I called him up to ask a favor — would he appear at Knuckleball Nation’s Atlanta clinic? He said yes and the rest is history. My clinics follow a similar structure — Saturday and Sunday for two hours per day. I discuss critical components of the knuckleball delivery, step by step, and then everyone has a chance to throw some pitches off the mound to try the adjustment. We got things started off hot on Saturday by discussing how to put some mustard on the knuckleball. After all, the knuckleball is slow because of the grip and the lack of leverage, not because of the effort. We talked about how to separate those hips and shoulders to get that butterfly into the upper 60’s. That’s where you’ll have to live if you want to break into professional baseball. The tips I shared on Saturday saw immediate benefits, especially for the big guy from Alabama. The 17-year-old saw his velocity jump 5 miles-per-hour in one day. His father remarked that it was the first time someone was able to tell him how to “stay back” effectively. “Bama” said he finally understood just how to use his lower body to drive towards the target. Then came the big day — Niekro day. Phil showed up right at 2pm when we were set to start. Everyone gathered around the mound and Phil Niekro spent the next 30 minutes giving a lecture on a variety of topics surrounding the knuckleball. He talked at length about how the knuckleball is the backdoor into professional baseball, that the knuckleball is elusive and will give everyone fits, and that you have to commit; eat, sleep and drink the knuckleball. Do that, he said, and you have a chance. Every. Single. One of them. He also spent some time praising me, my knowledge and my skill with the knuckleball. It was satisfying and flattering. Niekro was then nice enough to watch every kid throw about 10 pitches, giving everyone who attended some encouragement and a few personal tips. After signing autographs and standing for a few pictures, the Hall of Famer left the building. We had an hour to get back to work before the clinic was over. 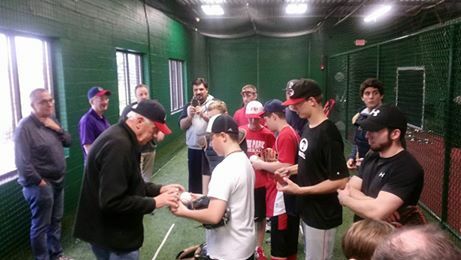 I hope to continue these “Legend Series” knuckleball clinics. The next one takes place in Los Angeles on February 11th and 12th with Charlie Hough. If the success of these events continues, I may be able to schedule clinics with RA Dickey and Steven Wright in the future. I hope to see you at one of these events soon.